See the best sights and learn about the diversity of Gloucester since 1623. This scenic tour takes you around America’s oldest seaport, touring the rocky coastline, beautiful beaches, and historic downtown, passing by lighthouses, lobster traps, artist studios, and homes painted by Edward Hopper. No matter if it is your first trip or if you live here-- come with us to discover THE BEST OF GLOUCESTER! Gloucester is America's Oldest Seaport, is the home to America's longest living artists colony, and see the sites of some award winning movies -- The Perfect Storm with George Clooney, Manchester-By-The-Sea with Casey Affleck. 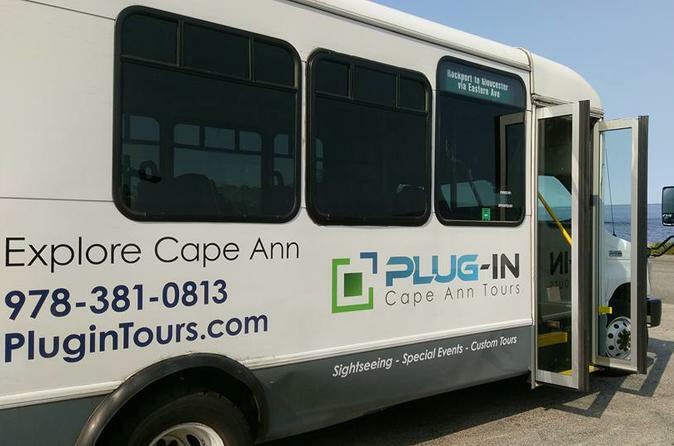 Our tour guide will welcome you onto a climate controlled 14 passenger bus -- telling stories highlighted by historical homes, the fishing industries oldest landmarks, memorable movie sets and many picturesque places. It's the best way to get to know all that Gloucester and Cape Ann has to offer. Whether you are alone or with a group, a Gloucester native, or you are staying at a vacation home here on the New England coast, let us help you find your way around, and get a local insight for the BEST lobster roll, The BEST cannoli or the BEST place on the east coast to watch the sunset. Please call us 978-381-0813, or reserve your spot online, and see why people return to this hidden gem north of Boston year after year! Our tours operate safely and comfortably in most weather conditions. We will have umbrella's in case it rain's! You can park just in the metered lot in front of the Fitz Henry Lane building (before 6pm, Monday-Saturday, free all other times), as well as plentiful street parking. We do offer pick-up from the MBTA stations and some area hotels and B&B, email FRIENDS@PLUGINTOURS.COM to make these requests. Yes, friendly, well trained dogs are allowed on this tour. Please be sure to call in advance to let us know you are bringing one dog. Each tour is limited to just one.